TSXV-listed White Gold Corp (WGO) is emerging as one of the most significant players in Canadian gold exploration, and with the largest land package in the Yukon’s White Gold District, famous for the 19th century Klondike gold rush, it’s hard not to see why. Boasting 35 properties across a massive 439,000 hectare land package, having a robust pipeline of discoveries, two existing gold resources, a world class management team, and backing by both Kinross Gold and Agnico Eagle Mines, the company is certainly making a name for itself. The region is part of a series of structurally controlled vein deposits known as the White Gold District, south of Dawson City, and along the 1,200km-long Tintina gold belt. Some estimates put the placer gold recovered along the belt at between 13 and 20 million ounces, but despite the number of deposits in the area, the hard rock source of this placer gold has never been identified. 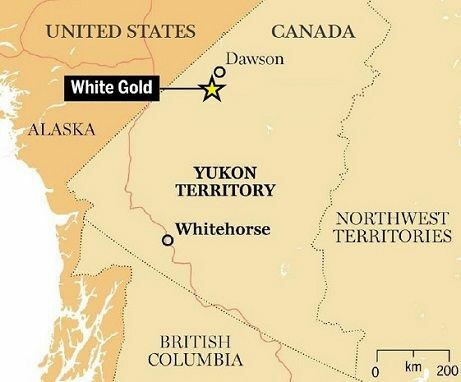 Some say the district's current ‘new age gold rush' was kicked off by legendary Yukon prospector, and White Gold Corp's chief technical advisor, Shawn Ryan. Years ago he staked and acquired a huge package of prospective properties, optioning them off to different junior mining companies. However, after millions of dollars of exploration work, in a soft gold market, the claims lapsed and all reverted back to Ryan, who then spent years reviewing the data, picked the best projects, partnered with PowerOne Capital in Toronto, and created White Gold Corp; this time with a systematic exploration strategy and a regional approach to exploration in the district. Among White Gold Corp's highlights, according to CEO David D'Onofrio, is that "we have a very strong exploration pipeline of regional targets across our significant land package. Combining our more than one million acres of claims with our regional exploration methodology, we are primed for the continued generation of new discoveries to build our existing resource base". D'Onofrio says the company's "unique combination of factors" make White Gold Corp a growing leader in the gold exploration space, and sees only more potential for both resource expansion and new discoveries. Some of those unique factors include the impressive names on the executive team. They include aforementioned Yukon prospector, Shawn Ryan, and director Rob Carpenter, the former CEO of Kaminak Gold, prior to Kaminak's sale to Goldcorp for $520 million in 2016. That was shortly after Kaminak, which first developed an interest in the White Gold District in 2009, announced a mouth-watering feasibility study on Coffee, its Yukon-based project. The report suggested the mine would be paid for in just two years with 3.4Moz of gold. No doubt, White Gold believes similar things will flow from its own substantial property portfolio in the very same district. White Gold Corp has been turning heads with its strong exploration pipeline and its 2018 drilling results. D'Onofrio says about the 2018 season: "Our proprietary exploration strategy produced four brand new gold discoveries, some drilling highlights include - Vertigo with 23.44g/t over 24.38m, Ryan's Showing with 20.64g/t over 6.09m, GS West with 2.97g/t Au over 10m and Betty with 1.08 g/t over 50.29m." In an industry where even a single gold discovery would be notable, White Gold's generation of four high-grade discoveries in a single year displays the power of its proprietary exploration strategy. On this D'Onofrio says: "Unlike a typical junior mining company, there is no incentive for us to prolong work on a property where we don't see potential. We are systematically performing low-cost exploration work across our entire portfolio to guide where further exploration dollars are spent." 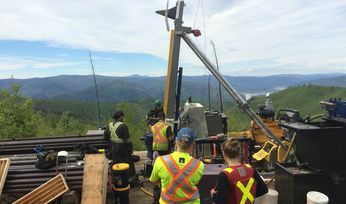 The team has also continued work at its namesake White Gold property, identifying additional mineralization up-dip at its flagship asset Golden Saddle, while metallurgical test work is ongoing at the adjacent Arc deposit. The raw data from recent drilling speaks for itself. The group filed an NI 43-101 resource and technical report that highlighted an indicated mineral resource of 960,970oz at 2.43g/t gold and inferred of 282,490oz at 1.7g/t gold in the Golden Saddle and Arc deposits. "Our multiple high-grade discoveries from last year included Vertigo - one of the most exciting discoveries of the year across the entire Yukon." D'Onofrio continues. 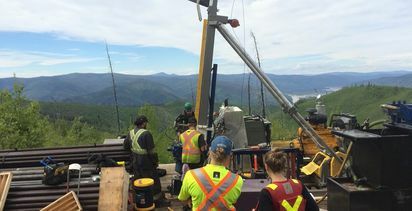 "More drilling at Vertigo will further demonstrate the potential of this massive system as there are indications that similar targets exist along the 14km trend, demonstrating regional-scale potential." Surface grab samples at Vertigo, he said, showed continuity of high-grade mineralization to the west along the E/W trend from 250m to 700m from previous sampling, with some highlights including drill intercepts of up to 103.9g/t and grab samples up to 304.3g/t gold. Also to note is the Betty property which runs contiguous to Goldcorp's 3.4Moz Coffee deposit, and is adjacent to Western Copper & Gold's 8.9Moz Casino project. White Gold appears to certainly have one of the most promising land packages. In late 2018 the company completed a round of financing, "This leaves us with adequate capital to continue to explore the Vertigo and White Gold targets and regional prospects through the 2019 exploration season," says D'Onofrio. White Gold hardly lacks financial muscle. Kinross and Agnico Eagle each own more than 19% and they are backing the debt-free company to the hilt, both technically and financially, says D'Onofrio. Early 2019 has begun with a bang after White Gold acquired the QV property from Comstock Metals, including its 230,000 oz gold resource, the VG Zone deposit. D'Onofrio says: "We knew this acquisition was a great fit for us, as the QV property has undergone extremely limited exploration work to date." White Gold is primed to maximize value on its acquisition, as its exploration team already has extensive experience with the QV property. Shawn Ryan was the original owner and prospector who optioned it to Comstock back in 2010, and Jodie Gibson, White Gold's VP of exploration, oversaw the original drilling that produced the VG Zone deposit. "Our team sees a lot of potential on this property for both resource expansion and new discoveries," says D'Onofrio. "And its multiple targets share many similarities with our current assets, including Golden Saddle and Vertigo." The VG Zone deposit was said to share strong similarities to the Golden Saddle deposit both in structural setting as well as mineralization style, and is open along strike and at depth. Additionally, the exploration targets on the north of the property displayed the same geochemical and structural setting as the Vertigo discovery 23km to the east. All indicating that this acquisition was a very smart move for White Gold. "As we move into the next drilling season, our exploration strategy continues to be two-fold: to further expand our existing resources and to grow our portfolio through new discoveries." Work at GS West and Ryan demonstrated the existence of satellite deposits surrounding the Golden Saddle deposit on trend. "We will continue to test similar targets, growing this into a true gold camp." He is also eager to explore the newly acquired QV property which remained "vastly underexplored"; to date there has only been 17 diamond drill holes which made up the resource estimate, and an additional six holes drilled in 2017, which expanded the footprint of known mineralization past the original resource estimate. "Last year brought multiple high-grade discoveries, expanding our land position and adding a new resource to our portfolio, and we're excited to continue to build on this success in the upcoming year," says D'Onofrio. "Like pearls on a necklace, but much more valuable"